"Tenor Scott Ramsay sang with power and fluidity, and made a surprisingly moving figure of Dantine." "Scott Ramsay wields a formidable tenor as Wilhelm Dantine, the fictional studio animator Disney canned for having tried to create a union." "Tenor Scott Ramsay's Willhelm Dantine was beautifully articulated, youthful and vigorous...."
"Scott Ramsay was a more distinctive Narraboth, singing with both lyricism and enough edge to compete with the orchestral roar behind him." "Standouts included Scott Ramsay’s hypocritical Gherardo"
"Ramsay's smooth lyric tenor enhanced Tom's sympathetic side, as in his remorseful aria sung on his knees at Mother Goose's whore house and at the beginning of act II, where he lamented ‘the gap in my heart.'" "As the free-loving Duke of Mantua, Scott Ramsay proved a fitting tenor.... He sold the cluelessness that comes with the obsession for constant sexual conquests under the guise of nobility. His take on ‘La donna e mobile' was one where his lithe tenor gave a buoyancy to the irony of the music and lyrics." "... Ramsay took the part of the ill-fated Lenski ... and in his big aria just before the duel with Onegin, Ramsay delivered solid evidence of his growing reputation." "Tenor Scott Ramsay's 'Una furtiva lagrima,' from Donizetti's 'The Elixir of Love,' was sweet and sorrowful. I found it hopelessly romantic." "Scott Ramsay sang an ardent Ingemisco with a bright lyric tenor of strength and beauty." "Scott Ramsay was a heroic Edgardo ... his delivery in the final scenes was heart-wrenchingly tender and beautiful." 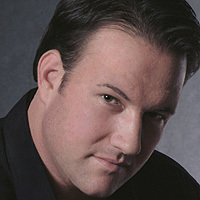 "Scott Ramsay, the tenor, had a shimmering upper register and a clear, expressive voice." "Scott Ramsay (Fritz) and Wendy Bryn Harmer (Wanda) played the peasant lovers to perfection, and both more than held their own in their onstage musical jousts with Blythe." "Scott Ramsay is the finest tenor we have heard in years, and his bright, fine-grained voice was perfect for this French title role." "Scott Ramsay‘s Ferrando showcased a commanding, controlled tenor throughout the night."